Social RPG's and Casual Gaming are the diseases within our community. Even Square-Enix, the kings of beating dead horses, cancelled their Social RPG's earlier this year, citing a lack of substance and worth. Cant get over how his art work seems copy and pasted over the initial design....blah. No emotion at all. This is pretty bad example in this case. 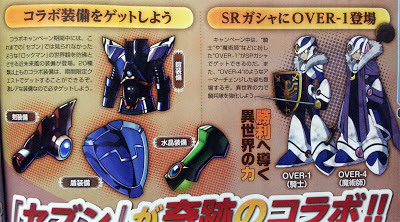 But it's... par for Xover's art. All the various Over-#s are drawn over or the same stock art Over-1. Yep, just keeps getting weirder. Who needs emotion when you have a fur collar? Bleh, is this game really doing so well in Japan to warrant it's continuation? That worries me very much. Considering he is the protagonist of xover, how you expected his expression to be? He surely isn't happy with his situation.